The DEWALT DWFP12569 2-N-1 Flooring Tool engages all flooring profiles and protects prefinished flooring. At only 10.6 lbs, optimized for the most popular solid flooring fasteners. 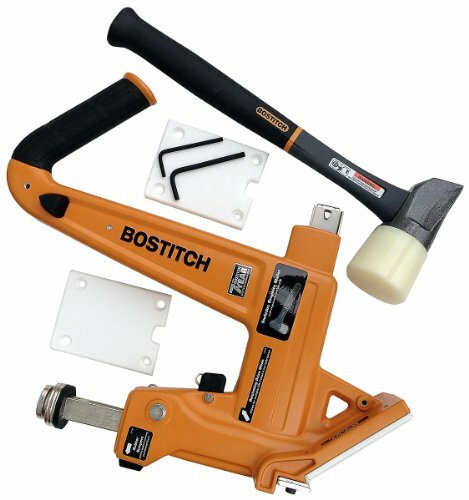 The BOSTITCH BTFP12569 2-in-1 Flooring Tool drives 15.5ga staples and 16ga cleat nails from 1-1/2" to 2" length. It features mallet actuated pneumatic driving action, along with non-marring, interchangeable base plates. This tool is ergonomically designed with longer handle and comfortable rubber grip and is lightweight at 10.85 lbs. Low air requirements at 3.7 SCFM. Designed for hardwood and engineered flooring installation, which helps eliminate gaps between flooring boards. For 1/2" (12.7 mm) through 3/4" (19.1 mm) flooring, ready to use out of box. Includes Tool, Mallet, Oil, Wrenches, 1/4" (6.4 mm) air fitting. DRIVES: 15.5 GA flooring staples or 16 GA "L" shaped flooring cleats from 1-1/2" to 2" length. NON-MARRING BASE PLATES: For 1/2 (12.7 mm) through 3/4 (19.1 mm) flooring. ERGONOMIC DESIGN: Has long handle with a comfortable rubber grip. INCLUDES: Nailer, Interchangeable Base Plates, Mallet, Wrenches and 1/4 (6.4 mm) Air Fitting with Dust Cover. This 3 PLUS HFS509040SP is a 4 in 1 tool that can shoot both 18 gauge brad nails and narrow crown staples.This versatile nailer is ideal for flooring installation up to 5/8'', and can be easily converted to a standard combination stapler/brad nailer for finish work by switch the nose. It features a light weight die-casting magnesium body, tool-free adjustable depth control, tool-free quick-clear jam release, 360 degree air deflector. 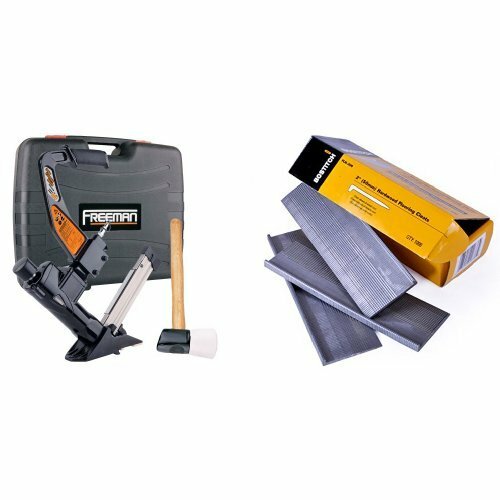 The Freeman PFL618BR Pneumatic 3-in-1 15.5-Gauge and 16-Gauge 2" Flooring Nailer and Stapler with Case is perfect for construction contractors and DIYers to install 1/2" to 3/4" solid tongue and groove hardwood flooring. This air powered tool is compatible with 15.5 gauge 1/2" crown staples, 16 gauge T-cleats, and 16 gauge L-cleats from 1-1/2" to 2" for all three types of fasteners. 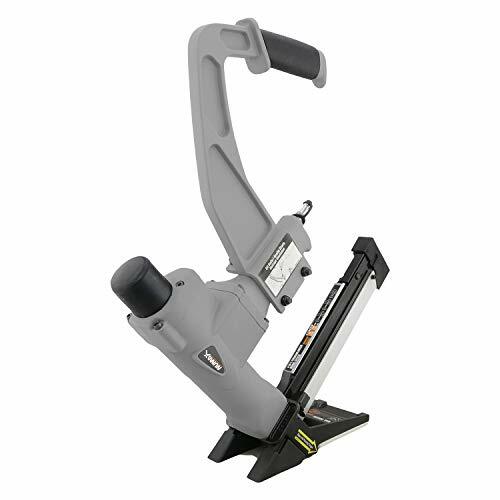 The lightweight body of this combination flooring nailer and stapler is constructed of die cast aluminum, with a hardened steel one piece drive blade for durability. Two interchangeable no mar base plates provide stability for this versatile tool and prevent damage to finished flooring surfaces, ensuring professional results. Recent upgrades have been made to the shape of the foot, along with adding a semi-quick release for easier access to the drive blade in the event of a jammed fastener. Other features include an ergonomically designed handle to reduce fatigue during use, and an air filter / anti-dust cap to protect internal components from debris. The Freeman PFL618BR Pneumatic 3-in-1 15.5-Gauge and 16-Gauge 2" Flooring Nailer and Stapler with Case includes a wooden handled flooring mallet with a rubber head, plastic blow molded storage case, safety goggles, air tool oil, and adjustment tools, and is covered by Freeman's 7 Year Limited Warranty and 90 Day Wearable Parts Warranty. 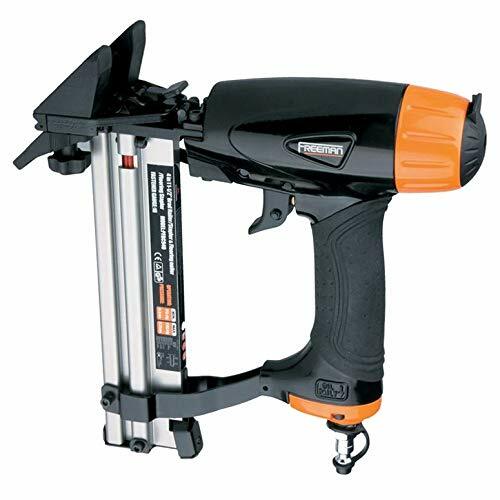 PRO DESIGN: This nailer features a durable & lightweight aluminum body, long reach handle with padded grip. & heat-treated one-piece hardened steel driver blade. It comes with a carrying case, oil, wrenches, goggles, and a no-mar white rubber mallet. 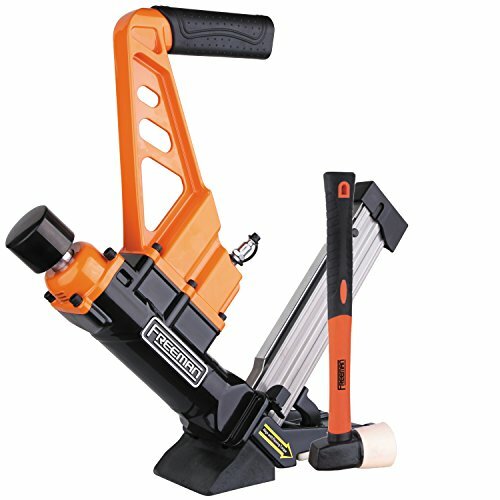 This flooring nailer gives you the flexibility to switch between the two most popular flooring fasteners without having to carry around two separate tools. Designed to stand up to the rigors of everyday use, it is built with a hardened steel drive blade, rubber O-rings, and an aluminum body. The nailer features a light strike bumper, and comes with a lightweight fiberglass mallet. The white rubber head prevents marring when you move your flooring into place. On the rare occasion the nailer jams, the tool-free quick release makes it easy get back to work quickly. The 360 degree swivel Industrial NPT fitting gives you flexibility when moving around, and the air filter and anti-dust cap keep the tool s interior clean and running smoothly. Each nailer comes with a padded bag with front and interior pockets. This nailer can install most 1/2" 3/4" solid tongue and groove flooring, and comes with two interchangeable base plates. The no mar base makes it safe to use on prefinished or unfinished flooring. The 2-in-1 Nailer is designed to use 16 gauge L-cleats from 1.5" 2" long, and also can use 15.5 gauge 1/2" Crown Flooring Staples from 1.5" 2" long. 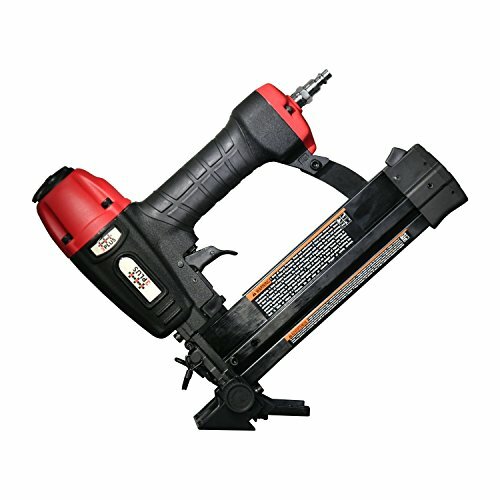 This flooring nailer is compatible with any brand staples or L-cleats. The 2-in-1 Flooring Nailer (Model: EFL50Q) is suitable for any professional or do-it-yourselfer. 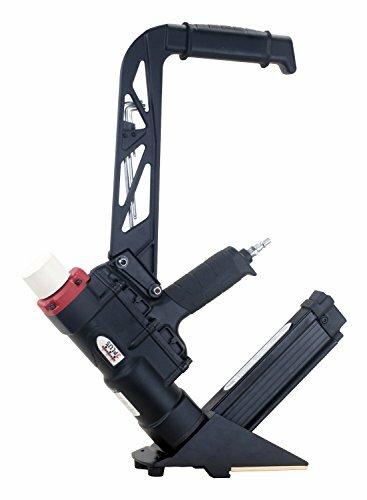 This flooring nailer is part of Estwing s professional line of pneumatic tools, and is covered by a 5 Year Professional Tool Warranty and a 90 Day Wearable Parts Warranty. NAILED IT: This versatile flooring nailer uses 16 Gauge L-Cleats and 15.5 Gauge 1/2" Crown Flooring Staples. Two interchangeable base plates let you install 1/2" - 3/4" solid hardwood including cherry, oak, maple, walnut & other nail down tongue and groove flooring. PRO DESIGN: This nailer features a durable & lightweight aluminum body, tool-free quick release to clear jams quickly, no-mar feet & a light strike bumper & interchangeable base plates. It comes with a fiberglass mallet & padded bag, plus wrenches & oil. The next generation from Powernail is engineered and designed with performance in mind. The re-designed FLEX Foot offers a simpler solution for varying wood thicknesses, requiring only a single adjustment. It also slides off the tool allowing you to top nail close to the wall. The nose fits tightly into the nail pocket and slides securely along for superior control. Its compact size fits tight to the wall allowing for faster starts and finishes. It has an easy jam clearing gate mechanism. Combine this tool with our PowerStaples and you can securely fasten a wide variety of engineered flooring. The Model 1845F is the perfect performance match for the next generation of flooring. Brand: Powernail | Manufacturer: Powernail Company, Inc. The Bostitch MIIIFN Pneumatic Flooring Cleat Nailer lets you create professional-looking floors quickly and comfortably. 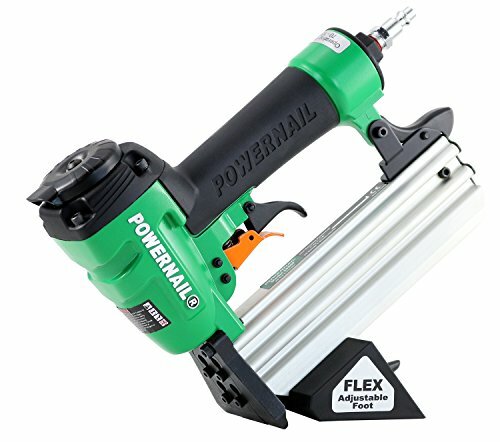 Its high-speed pneumatic operation rapidly drives nails into both unfinished and pre-finished hardwood flooring, and its long-grip handle allows you to maintain a comfortable posture when working. Tackling prefinished flooring is no problem with the included adapter foot and the extra-wide base plates that drive staples exactly where you want them. 1.5" to 2.0" L-shaped cleats are ideal for installing hardwood flooring. View larger. Adaptor foot and FloorGuard graphite mallet provide stability and control. Interchangeable base plates help you drive cleats at the proper angle and depth. Cleat nailer, FloorGuard graphite mallet, pre-finished-flooring adapter foot, and two base plates (1/2 inch and 3/4 inch). The Porta-Nails 465SLT 3-in-1 Pneumatic Floor Nailer and Stapler drives 16-gauge L- and T-style flooring cleat nails, as well as 15.5-gauge flooring staples. The 465SLT comes complete with non-marring mallet, 3/4 in. pre-attached base plate, 1/2 in. interchangeable base plate, wrenches, oil and a carrying case. Perfect for installation of 5/8 in., 3/4 in. and 33/32 in. domestic solid wood, 3/8 in. to 9/16 in. solid wood, and 9/16 in. engineered wood flooring. The versatile magazine holds 100 nails or 120 staples. Extremely easy to use at just 10.75 lbs. with an operating pressure range from 70 to 120 psi. Take on your next project with the NuMax 2-in-1 dual handle flooring nailer and stapler and enjoy the ease of installation that comes with a quality tool. 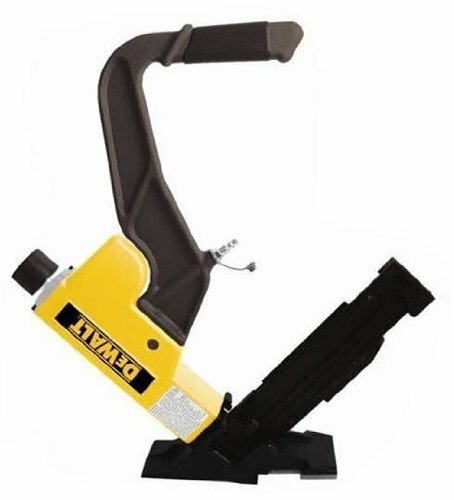 Boasting an aluminum Cylinder and high quality rubber O-rings, This nailer is designed to last and will pay for itself for the same price (and less hassle) of a weekend rental. Install 1/2 to 3/4 solid hardwood including cherry, Oak, maple, walnut and other nail-down Tongue and Groove flooring. The dual-capability magazine drives both 16 gauge L-cleats (1-1/2 to 2 ) and 15. 5 gauge crown flooring staples (1-1/2 to 2 ) with ease. 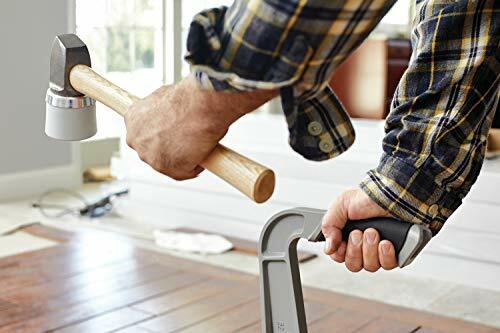 The NuMax S50LSDH also comes equipped with a dual handle design use the short handle if you prefer to knee during installation, or quickly screw in the extended composite handle on to save YOUR back while standing. The composite handle minimizes vibrations when working, and the lightweight aluminum body makes it perfect for extended use. Other features include: a no-mar foot to protect pre-finished surfaces, a semi-quick release nose for easy jam removal, NPT fitting, and a wooden mallet and light strike bumper for easy operation. The NuMax 2-in-1 dual handle flooring nailer is backed by our NuMax 1 year limited and a 30 day wearable parts . 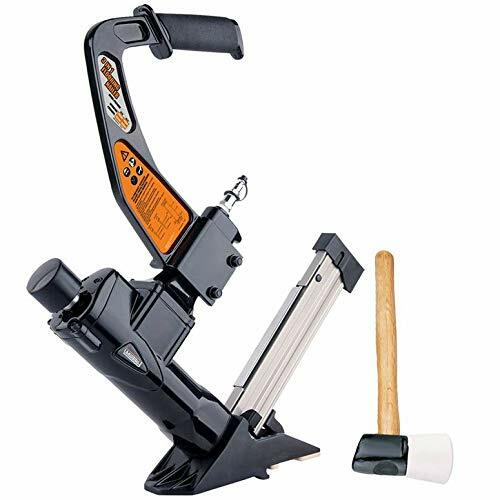 NAILED IT: This 2-in-1 flooring nailer/stapler works with 16 gauge L-cleats & 15.5 gauge " crown flooring staples. It features a dual handle design with a short & an extended handle to suit your installation method for solid wood or engineered flooring. 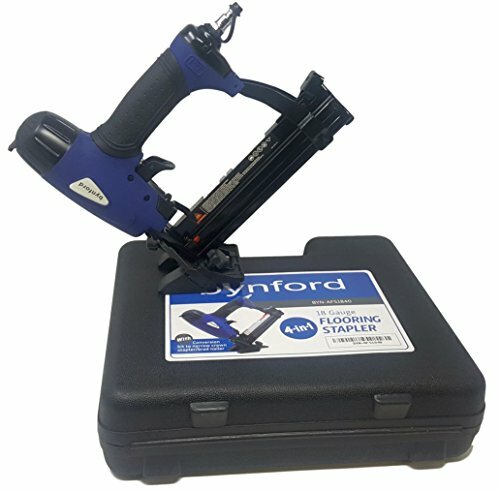 BYNFORD HARDWOOD FLOORING STAPLER NAILER (For conventional 5/8" & under T&G flooring AND SHAW type flooring groove side stapling). An economical and well made general purpose hardwood flooring stapler. Although not recommended for commercial use, this is ideal as a backup tool for the contractor, or for the person laying their own floors (way cheaper than a few days rental!) the value in this tool is hard to beat. This tool is ideally suited for floors up to 9/16\", although we recommend you check your flooring instructions to make sure the 18 gauge narrow crown staple is recommended for your floor. Some thicker harder floors (eg. Bamboo) may require a larger tool. On harder woods, we recommend using the shortest staple which meets your installation requirements. This tool has also been recently re-designed to allow it to staple down floors with the extended lower lip on the groove side which require nailing on that side (some SHAW etc). Although rated for up to 9/16\", it will work on 3/4\" for work in tight corners etc, but most 3/4\" flooring does recommend a heavier fastener. And when done your floor, you can easily switch of the nose for a standard one (included) which converts the tool to a standard narrow crown stapler/combination 18 gauge brad nailer! AND NOW INCLUDES BM PLASTIC CASE. 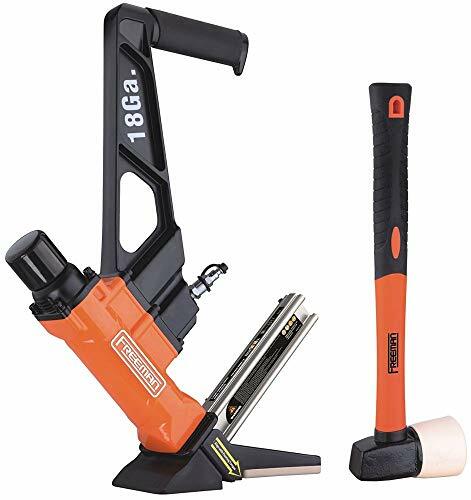 Uses standard 18 gauge narrow crown staples AND 18 gauge brad nails up to 1-9/16"
The Freeman 18ga L Cleat Flooring Nailer offers an affordable solution for the professional and do-it-yourselfer for installation of hardwood floors such as Bamboo, Teak and other exotic woods. The drive blade is made of hardened steel with an aluminum cylinder and high-quality rubber O-rings. The body of the nailer is constructed of die-cast aluminum to stand up to the task of daily use. Generic L Cleats may be used with this model, however Freeman L Cleats are recommended. This nailer comes with 3 different sized base plates that provide stability and will protect the surface from scratches. 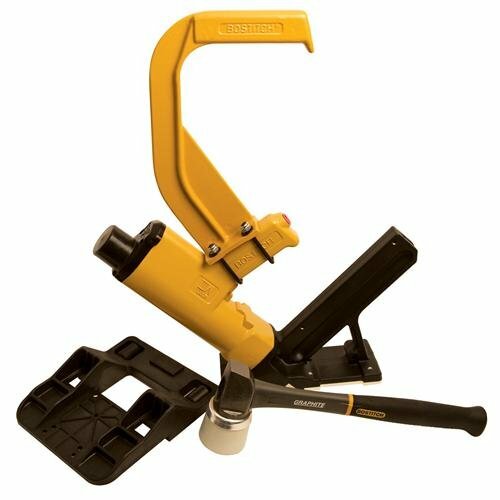 Oil, wrenches, fiberglass mallet with a white, no-mar head, and user manual are included, backed by Freeman s 7 year limited manufacturer s warranty. PERFECT FOR HARDWOOD FLOORING: This cleat flooring nailer drives 18 gauge L-cleats, ideal for installing dense flooring like strand woven bamboo, Brazilian teak, cherry, engineered flooring and other exotic hardwoods. Magazine holds up to 120 fasteners. The Model 2000F by Powernail is designed with performance in mind and is the ideal solution for fastening today's top Engineered and Laminate flooring. The 2000F features Powernail's re-designed FLEX Foot and only requires a simple adjustment to match varying wood thicknesses. The FLEX Foot can also slide off the tool, allowing you to top nail close to the wall. The 2000F's unique nose design fits tightly into the nail pocket and slides securely along the workpiece for superior control. The nose design also features a clearing gate for the quick and easy removal of jammed staples. 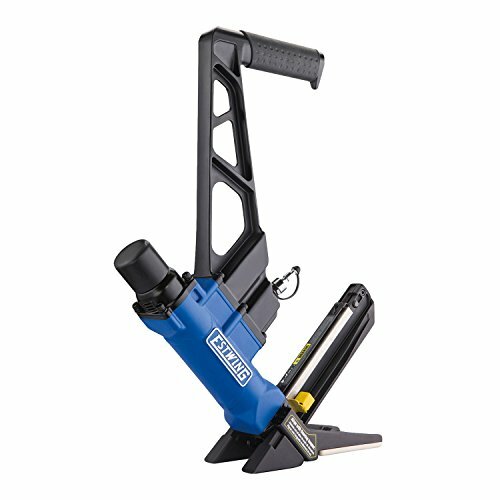 This tool's compact size fits tight to walls, allowing for faster starts and finishes. The Model 2000F is the perfect installation tool for a wide variety of today's top flooring. Includes Powernail's Large Tap Block and carrying case and has a one year warranty. Designed to stand up to the rigors of everyday use, the 18 Gauge L-Cleat Flooring Nailer is built with a hardened steel drive blade, rubber O-rings, and an aluminum body. The nailer features a light strike bumper, and comes with a lightweight fiberglass mallet. The white rubber head prevents marring when you move your flooring into place. On the rare occasion the nailer jams, the tool-free quick release makes it easy get back to work quickly. The 360 swivel Industrial NPT fitting gives you flexibility when moving around, and the air filter and anti-dust cap keep the tool s interior clean and running smoothly. Each nailer comes with a padded bag with front and interior pockets. This flooring nailer can install 3/8 solid or engineered tongue and groove flooring, bamboo, exotic wood, or other dense flooring. The no-mar base makes it safe to use on prefinished or unfinished flooring. 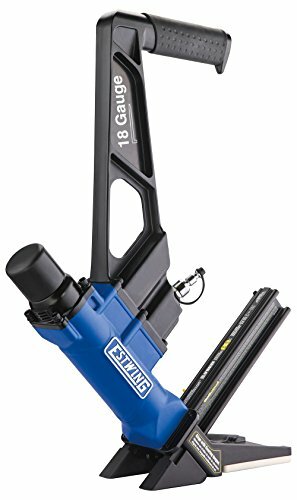 This nailer is designed to use 18-gauge L-cleats ranging from 1 1 long. This flooring nailer is compatible with any brand L-cleats. The 18 GA L-Cleat Flooring Nailer (Model: EF18GLCN) is suitable for any professional or do-it-yourselfer. 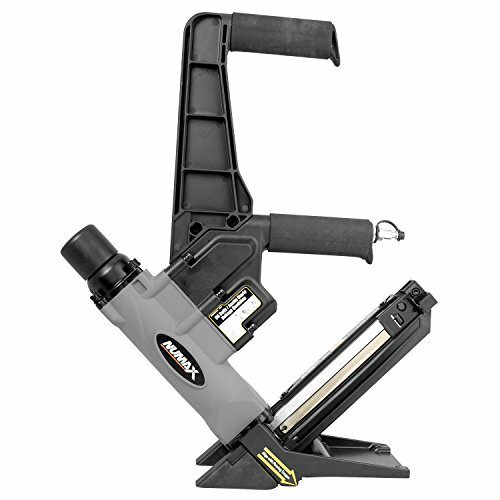 This flooring nailer is part of Estwing s professional line of pneumatic tools, and is covered by a 5 Year Professional Tool Warranty and a 90 Day Wearable Parts Warranty. NAILED IT: This flooring nailer uses 18-gauge L cleats to install 3/8" to 3/4" solid or engineered tongue & groove flooring, bamboo, exotic wood, or other dense flooring types. The no-mar base makes it safe to use on prefinished or unfinished flooring. This 3 PLUS HFSNSP tool is a 2 in 1 tool that can shoot both 15-1/2 gauge staples and 16 gauge L cleats with the same tool and magazine. You can complete your project with this one tool efficiently. It equipped with a convenient long reach handle with a padded grip. You could also remove the long reach handle and use the short one as you like, which is also grip padded. The kit also includes a set of flooring plates to help match different sizes of floorings. It is a perfect choose for contractors and residentials to complete the flooring installation job. The tool goes with two shoe plates. 1/4" shoe plate for 3/4" thick hardwood flooring; 5/16" shoe plate for 1/2" thick hardwood flooring. 2 in 1 flooring tool uses 15-1/2 gauge staples and 16 gauge L cleats ranging from 1-1/2" to 2"
Has pneumatic driving action. Used in hardwood and engineered flooring. The Freeman 3-in-1 Flooring Nailer/Stapler has the ability to equip 3 types of flooring fasteners (T-Cleats, L-Cleats and Staples) for the professional and do-it-yourselfer alike. The PDX50C is only 9.5 pounds, which will relieve some strain when working on long flooring projects. It is also equipped with an anodized aluminum magazine, no mar protection plate, air filter/anti-dust cap, one piece heat treated driver blade, self leveling front foot and high quality internal wearable parts. The PDX50C can be used on solid wood tongue and groove flooring measuring from 1/2-Inch to 23/32-Inch in thickness. 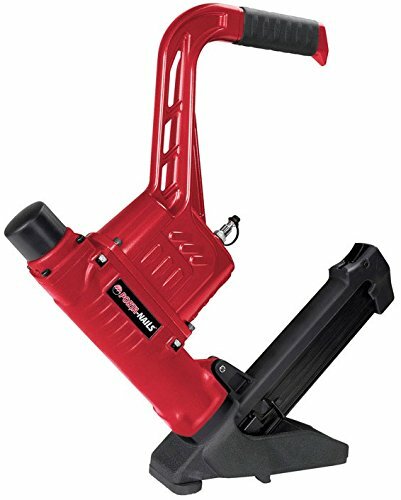 The PDX50C is the first of its kind on the market due to several factors: overall weight, eliminates the need for a prefinished flooring adapter and comes standard with a 3 pound fiberglass handle mallet. Like all Freeman nailers, the PDX50C nailer/stapler is also backed by the Freeman 7 Year Limited Warranty. NAILED IT: This 3-in-1 flooring nailer uses 16-gauge T-Cleats and L-Cleats & 15.5-gauge flooring staples. It comes with Interchangeable base plates that make it perfect for both solid wood tongue & groove or engineered flooring from for 1/2" to 3/4"
Drives 15 Gauge Crown Flooring Staples, 16 Gauge T and L Cleats, loads 120 staples or 100 Cleats. Two interchangeable floor plates to use for and Tongue and Grove Flooring. The no-mar interchangeable base plates add stability and protection against scratches to floor surfaces.